We visited two wineries in Strekov; I was both intrigued and impressed. Let’s start with impressed. Strekov 1075 is an interesting name for a family winery, with 12 hectares of vines on principally sandstone soils containing copious amounts of calcium and iron. According to co-owner Tibor Melecsky, the first documents for grape growing here stem from the 16th century. When considering east European wines, it helps to have a historical perspective. During the communist era, there were strict rules for wine producers, with the emphasis being on bulk wines for the proletariat. Now there is freedom, the emphasis is on producing quality wines, but nowhere have I seen such a passion for “doing it our own way.” It’s an almost stubborn approach, experimental to the point of being daring. Every single wine I tasted, for example, was produced using wild yeasts existing in the vineyard. There are few producers in the west who would risk using these unpredictable yeasts, which may or may not turn wine into vinegar. But as for Strekov 1075: they seem to know what they’re doing. To start with, their Rizling Vlassky (Welsh Riesling) sur lie 2009 has a beautiful lustrous bright gold colour and a bouquet containing a sour component which makes me think of mead. The wine is thick, almost oily in the mouth yet has surprisingly good acidity for a wine vinified sur lie, almost steely with a mineral expression. There are dimensions here, honey with stone fruits and a hint of oak. The Devin 2009 is a sublime wine which seriously could hold its own against Sauternes. Devin is a cross between Traminer and Red Veltliner and the wine has a gold colour and a very grapey nose with wooden spice notes. Deliciously sweet with layers of complexity, it even has a slight petrol. Aged 14 months in a 500 liter barrel, it has a truly beautiful noble sweetness which left me strangely silent and pensive after tasting. Moving to the reds, the Corpus Modrý Portugal (Blauer Portugieser) 2011 has a very light purple colour, Burgundy-like with a bouquet of raspberry and chocolate. Tart red fruits in the mouth with medium high acidity, low in tannins with an almost buttery finish. A light and lively wine, perfect for a picnic. 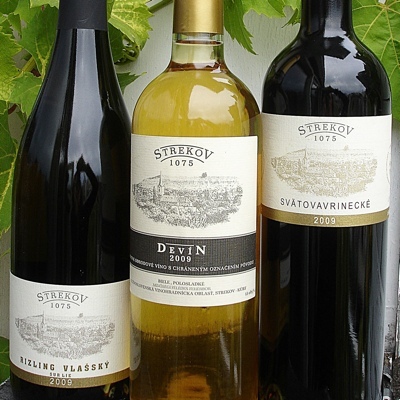 The Svatovavřinecké (St. Laurent) 2009 has a dark purple colour and a bouquet of dark grapes with spicey oak and pepper. This incredibly fruity wine is very much concentrated on berries – dark berries and blueberries, high in acidity and low in tannins. This is a wine meant to be quaffed; indeed it should be, since practically no SO2 is added. I swear, after the wine sat in my glass for ten minutes I could already taste the oxidation. Drink it fast and fresh, preferably slightly chilled on a hot day. Finally, the Alibernet 2011 is a cross between Cabernet Sauvignon and Alicante Bouschet which was created in the Ukraine. Coming from young vines (approximately five years old), it is dark in colour with a funky purple fruit nose with a barnyard component. It has a thicker mouth feel with that animal/brett taste in the offset. Perhaps not a wine for everyone, but intriguing to say the least and not unpleasant. After a delicious lunch of homemade goulash, we visited the next winery, Strekov – Kasynik. Owner/winemaker Gábor Kasynik owns 2.5 ha of land, with another 2 ha rented. The Veltlinske Zelené (Grüner Veltliner) 2011 Classic has a piercingly fragrant bouquet of green apple and honey. Barrel-fermented sur lie in 8-10 year old barriques, this a very expressive, not subtle wine with a fiery and spicey character. Lots of white pepper, it even made me sneeze! The Sauvignon Blanc Selection 2011 has a floral nose of citrus fruits with pepper. The grapes are left one day on their skins, covered with CO2, before being pressed. I’ve never tasted Sauvignon like this before, heavier and somewhat oxidized but still containing some acidity. It’s a style which might not please many foreigners, but 600 bottles are produced annually and enjoyed by the local population. Finally, the Dülö ‘Initium Red’ 2011 Classic is made from 90% Zweigelt and 10% Kékfrancos, or Blaufränkisch as it is called in Austria. According to Gábor, Zweigelt has a bad reputation in Slovakia due to the communist era, when it was overcropped to produce bulk wines. Not a lot of depth here, but a very lively and fruity wine with a youthful purple colour, low in tannins with good acidity and some residual sweetness. It’s not wine, but a special mention must be made for pálinka, a fruit brandy most often made from plums. Hungarians and Slovaks alike eschew industrial pálinkas, insisting that the best stuff is distilled at home in the basement. A good pálinka burns while going down, I was told. I reckon it has about 45% alcohol, and this stuff would put hair even on Brad Pitt’s chest.